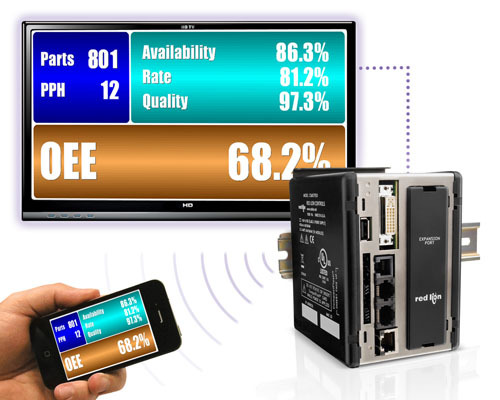 Red Lion proudly introduces the ProducTVity Station™, the only ready-to-deploy solution for collecting, recording and displaying critical key performance indicators and machine status messages on any TV, monitor, or projector equipped with a DVI/HDMI interface. Lean manufacturing, six-sigma, total quality management, continuous improvement – All of these terms refer, in some form or another, to the efforts of companies as they strive to become more competitive in a global economy. While various strategies are implemented in order to improve productivity, they all have two things in common – the collection of KPIs – key performance indicators – and the communication of those KPIs to the people who can most affect improvement – the production floor personnel. The ProducTVity Station excels at collecting data from a range of automation components. With a library of over 200 communications drivers, the PTV can communicate to PLCs, motor drives, motion controllers, bar code scanners and more. The PTV can also be expanded with CS series I/O modules, allowing it to accept digital and analog inputs from a range of sensors. With its fully programmable graphical interface, the PTV allows users to create high-definition visual management displays without the limits imposed by traditional LED-based lean manufacturing displays. Eye-catching displays that combine KPIs along with andon messages can easily be created. The ProducTVity Station’s 720p (1280 x 780 resolution) DVI output is compatible with both 720p and 1080p/i TVs with DVI or HDMI interfaces. The PTV’s built-in data-logger can record key performance indicators, as well as andon events for later review, and can synchronize the log files with any FTP server and/or Microsoft’s SQL Server® for further analysis. The ProducTVity Station ships complete with a 2GB CompactFlash card, as well as a DVI to HDMI cable (15´), and HDMI/DVI adapter. The PTV is programmed with Red Lion’s popular Crimson® software. Contact Us today to learn more about the ProducTVity Station and what it can mean for your business!